Mega Moolah can now be termed as a millionaire maker slot games. This is because of its huge jackpot worth over €3 million. The progressive jackpot has seen many winners walk away with seven figure prize money. The current situation depicts that 2015 will see the first jackpot winner of 2015 get awarded with about $3.6 million. Mega Moolah is a microgaming software development. Microgaming is world’s renowned online gambling software developer having being among the first providers when online gambling became a reality. 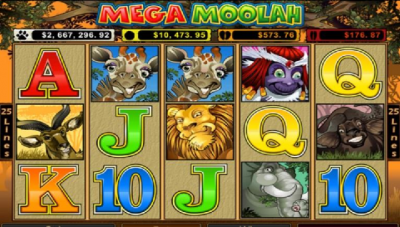 Mega Moolah features a 4-tier jackpot that you could win through the jackpot wheel. The 4 major prizes range from a small Mini Jackpot that starts awarding you from as little as $10 to the Mega Jackpot which starts gifting you from a million dollars. The jackpot grows with each bet you place across the network of casinos offering the game. There are plenty of players placing their bets on the game. This makes it easy for the jackpot prize to go high fast with the jackpot money reaching high seven figure value. It cannot be predicted when the jackpot will be hit. But from the information on the official website it is clear that most of the jackpots were won when they were worth around $3.5 million. This might imply that the jackpot might be won soon. This is the best time you should go aggressive on the game. Who knows you could be the next winner! Mega Moolah has made it to the books of record on December 2012 when a player was awarded with $9.49 million. As you have read above, Mega Moolah has the potential to change your life in 2015. You will definitely love the style and theme represented by the slot game. The theme is African represented by African animals that are having a good time on the reels. There are 5 card symbols found in the game and a bonus feature which can offer as much as 15 free spins and three times multipliers which can make you handsome wins even if you are not in a position to bag the multi-million jackpot. Mega Moolah is available on HTML 5 platform. It is thus available on your android, iPhone and Windows smartphones. Three recent memorable wins through Mega Moolah are £2,384,388 in June 2014, £1,898,527 in November 2013 and £1,665,528 in December 2013. Where do I play the game? Microgaming has made sure that Mega Moolah is available on casinos which have excellent customer service systems, security, reliable and offer guaranteed payouts. Some of the casinos where Mega Moolah is available are; Lucky Nugget, JackpotCity Casino, Platinum Play Casino, Bet365 and All Slots Casino in a myriad of many more. You can play the slot on your PC through a downloaded software or flash play from your browser or from your mobile device.